Ever had a poached burger? Pete’s, a legend in Prairie du Chien since 1909, has one of the most unusual burger cooking methods in America. And their burgers are so well loved, that’s the only thing on the menu. I mean sure, you can add chips and a soda, but that’s about it. 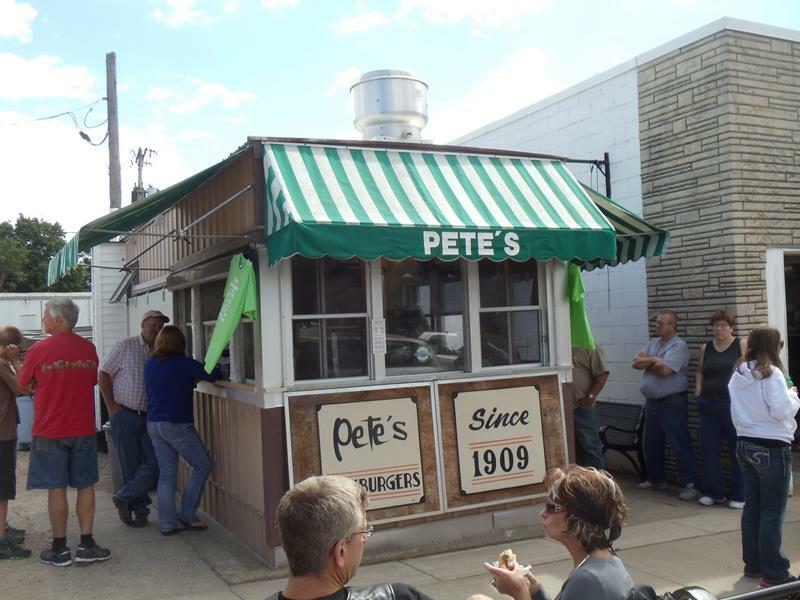 The origins of Pete’s date back to Pete Gokey, who would cook up hamburgers at local events. To help keep the burgers moist, he began pouring water on the flattop grill – and then flavoring that water with a pile of onions. 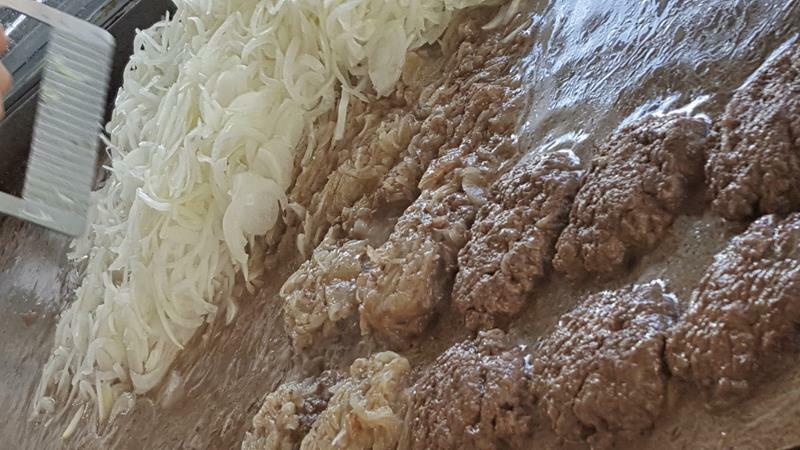 Today, Pete’s Hamburger stand on Blackhawk Drive employs a flattop grill, onions, and water to cook smashed 4-oz balls of fresh beef in a narrow trailer along the street. They cook the burgers up 60-70 at a time, constantly smashing the patties and letting the burgers cook in the flavorful stew-like water on the grill. After about 12-15 minutes when they’re cooked – most end up well done – they dole them out to patient customers. And they come from miles around. Pete’s burgers sizzling on the flattop, stewing in water and onions for a unique and delicious flavor. There are two ways to order burgers here: “With” or “Without”, referring to onions (all the burgers have a bit of an onion flavor because of the onion-y water they cook in, but you can have them add more stewed onions on top.) Pete’s doesn’t offer cheese on its burgers; I mean really, how are you going to properly melt cheese on a burger cooking in water? You’re welcome to add your own if you want, though – and they have the other toppings and condiments you may prefer. But really, a Pete’s plain on that small locally-make bakery bun is about as pure and tasty of a hamburger as you can get! See more about Pete’s from this Burger Land: Wisconsin segment on the Travel Channel. Moreover, State Trunk Tour founder Eric Paulsen manned the grill at Pete’s for the Discover Wisconsin show… see how it works here! You’ll find Pete’s on Blackhawk Drive in downtown Prairie du Chien, just north of Highway 27, a few blocks west of Highway 35, and two blocks north of U.S. 18 & Highway 60. The bridge to Iowa is mere blocks away, and all the action on St. Feriole Island from the Dousman House to Villa Louis is also close by.